Make your '04-Current Chevy Colorado or GMC Canyon "Tough-looking" with this Rally Stripe hood, roof and rear gate graphic kit. This kit is specifically made for the '04-Current Chevy Colorado or GMC Canyon factory hood, roof and rear gate areas per fitment chart below and will not fit any other vehicle. 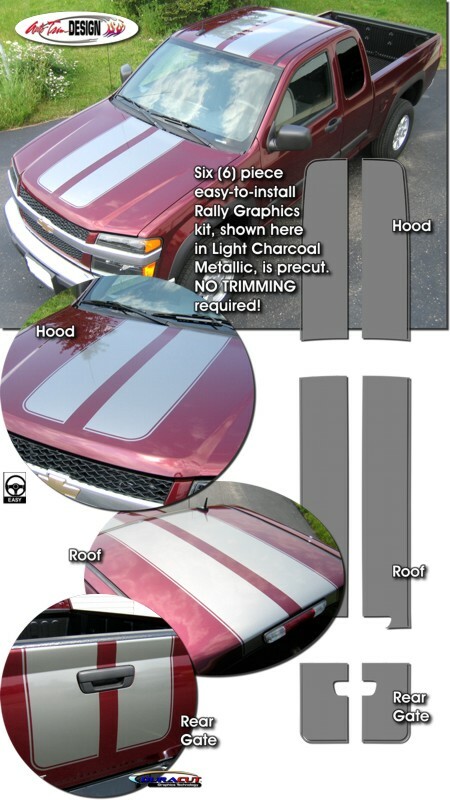 Optional Tonneau Stripe kit is available as shown above. Due to different configurations of Tonneau Covers, stripes require trimming after installation.